Have we reached an inflection point for mobile marketing in student recruitment? Mobile marketing is hardly a new idea. Indeed, considerable ink has been spilled in the general press and otherwise as to the rising share of Internet traffic claimed by mobile and the expanding range of mobile marketing ideas and strategies either in use today or on the drawing board for tomorrow. We come back to the topic in today’s post though because it feels to us like we are approaching – perhaps we have reached it already – an inflection point for mobile marketing in international student recruitment. 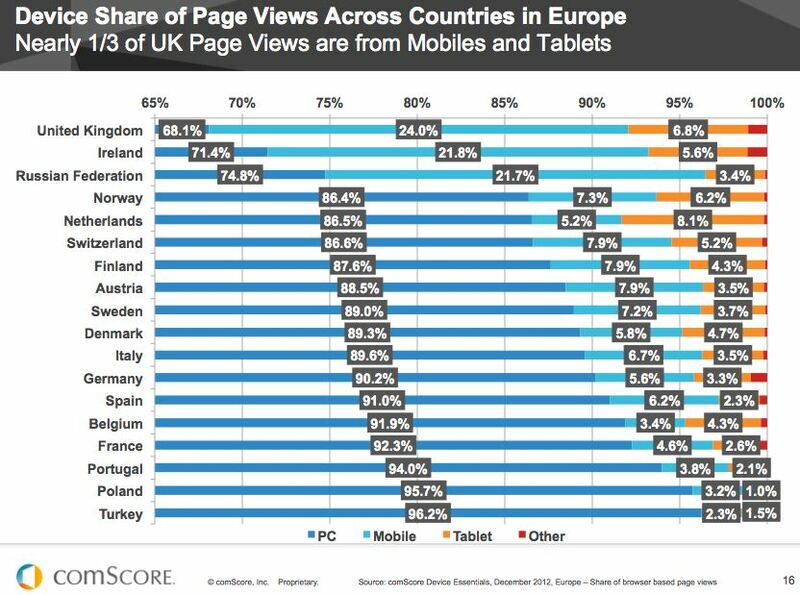 Because of this, ICEF Monitor readers can expect more on mobile marketing in our digital pages in the months ahead. For the moment though, let’s consider a few recent findings on the rising tide of mobile Internet usage and how this is beginning to impact marketing spending and marketing strategy. 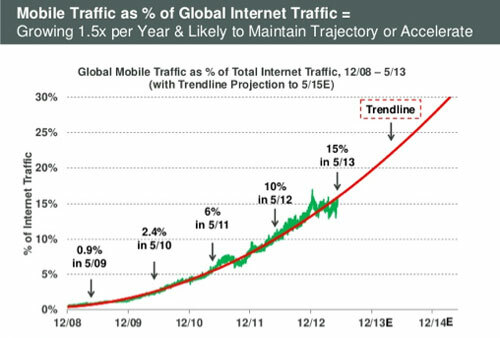 As of May 2013, mobile traffic accounted for 15% of global Internet traffic – up from 10% of global traffic a year earlier and 6% in May 2011. By some estimates, mobile will overtake desktop Internet access as early as next year – check out the infographic at the end of this article. Another fact to highlight in the infographic below: women aged 35 to 54 are the most active group in mobile socialisation. In other words, don’t just think of students when it comes to mobile marketing; consider the parents as well. 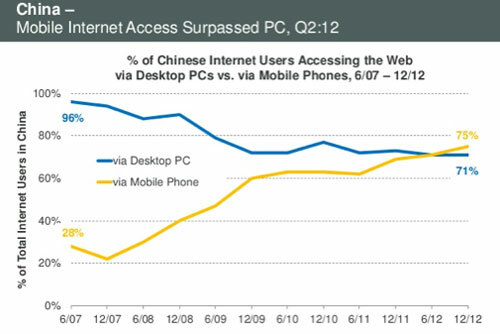 And in China, current data indicates that mobiles have already taken over desktops (see the chart below). Mobile advertising revenue is growing at a pace beyond earlier estimates and is expected to reach US $11.4 billion worldwide in 2013 (as compared to US $9.6 billion in 2012). And a recent report from US research firm Gartner projects that global mobile advertising revenue will grow by 400% between 2011 and 2016, reaching US $24.6 billion. “Marketers need to acknowledge that mobile advertising is now becoming mainstream; at the same they need to think holistically about how mobile interactions can support their marketing and customer relationship aspirations and avoid treating mobile advertising as a channel silo,” said Andrew Frank, a Gartner analyst. “Mobile’s share of digital ad spending is growing more quickly than expected and, as a result, the spend on desktop ads will peak next year as marketers turn their focus to reaching smartphone and tablet users, according to new data from eMarketer. In September 2012, ICEF Monitor reported the finding that 52% of US college prospects viewed educator websites on mobile devices. But more recent data suggests that the use of mobile devices among prospective students, and the degree to which mobile factors in student recruitment, has only expanded in the year since. 78% of study respondents have regular access to a mobile device; 80% of which are smartphones, tablets, or an iPod Touch. Perhaps reflecting the high-involvement nature of the choice of an education institution/destination, 82% of respondents said they preferred to look at educator websites on a desktop device rather than a mobile device. However, 68% said they have viewed educator websites on a mobile device (up from the 52% reported in 2012). The study is based on a survey of over 2,000 college-bound US high school juniors and seniors, and covers a wide range of their online and mobile browsing behaviour. In order to determine the impact that mobile browsing is having on the college search process, it explores their usage of email, phones, and social media, as well as the influence of websites on their perception of a campus and a college website’s content priorities (as illustrated below). As these latest figures suggest, mobile has moved from the nice-to-have source of competitive advantage that it may have been in years past to a must-have aspect of an overall web strategy today. It would not be overstating the case to say that websites aimed at prospective students now must include a mobile site or reflect an adaptive or responsive site design in order to effectively reach their intended audiences. In the coming months, we will take a closer look at various aspects of mobile marketing and how the growing importance of mobile continues to shape and challenge online marketing conventions going forward. This entry was posted in Africa, Asia, Australia/Oceania, Europe, Marketing, Middle East, Most Popular, North America, Regions, Research, South & Central America, Technology, United States, Youth Trends and tagged study abroad, Trend Alert, youth trends, mobile learning, primary schools abroad.